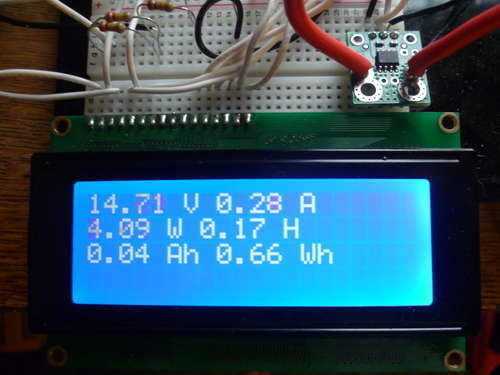 For my off-grid Ham Radio and Solar projects, I needed a way to measure volts, amps, watts, amp hours and watt hours. There's a couple of commercial products that can do this, but not with the flexibility I wanted. I designed a Arduino micro-controller based solution that is very extensible. Right now it monitors the above values of attached gear, and I'm thinking about adding web monitoring and a sd card for data collection. Well, let's get started. 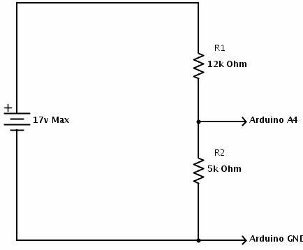 The Arduino can accept up to 5v on a analog input. 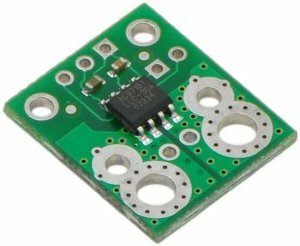 Our battery voltage can range as high as 17vdc in certain charge cycles, so we designed a voltage divider that would provide 5v at 17v battery voltage, and less at various lower voltages. See http://en.wikipedia.org/wiki/Voltage_divider for more information on Voltage Dividers. // we get the voltage on the pin. I have 4 possible nominal battery bank voltages. Each battery bank has a higher possible charge voltage during certain charge cycles. I've called this max, and will prevent a voltage of over 5v being sent to the Arduino pin during all charge cycles including equalize. All values are in k ohms. All parts were obtained from Hacktronics.com. I measured the voltage at A4 in respect to gnd, and with a 12.46 Vin, I got a 3.52 Vout. I also reported the actual ADC output of the analogRead by printing avgVal to the LCD, and got 778 out of a max of 1023 (0-1024). The next step is to track the current flowing, or produced by a source. We are using a ACS715 Hall Effect sensor to track the current being passed. Keeping a computer connected all the time is inconvenient, so I added a lcd display to the project. and read current flowing through the sensor. /* sensor outputs about 100 at rest. Analog read produces a value of 0-1023, equating to 0v to 5v. "((long)sensorValue * 5000 / 1024)" is the voltage on the sensor's output in millivolts. There's a 500mv offset to subtract. we get the voltage on the pin. to .00610 to match fluke meter. at load or supply and decide.